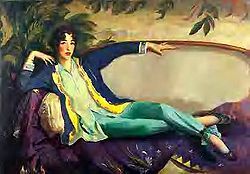 Karigee and I attended a lecture on Gertrude Vanderbilt Whitney (1875-1942) presented by David Garrard Lowe at the Metropolitan Museum of Art yesterday. It is part of the Met's Grand Dames series (next up: Coco Chanel) It was held in the Grace Rainey Rogers Auditorium near the Egyptian section of the Met. Not that I expected anything different, but the audience was 90% female and over a certain age - Kari said to me when we were leaving, "Now you know what it's like to be an old lady in New York City." While I didn't learn anything new from the lecture, Lowe is quite a character and made the presentation quite entertaining. To say the least, he has a great way with words and delivery. He had the old ladies in the palm of his hand. If you go by her on name recognition only, Gertrude needs no introduction - heiress, socialite, millionaire (and of course, the aunt and custodian of Gloria Vanderbilt, the poor little rich girl). But she was also a sculptress, art patron and founder of the Whitney Museum of American Art. I became interested in her several years ago. I find her fascinating and inspirational - a rich woman who refused to settle into a place of wifely duties and her station in life as a woman of uber wealth. She wanted more so she went for it - followed her dreams and interests and put her money to good work. Gertrude was the patron of Hopper, O'Keefe, Sloan and so many others. She started the Whitney Studio in the Village first and went from there. A must read book for anybody interested in women in history, art, or the guilded age of New York is B. H Friedman's work, Gertrude Vanderbilt Whitney: A Biography . Even though it is a biography, much of the text is provided by Gertrude herself - she was an inveterate journalist. She kept journals from a very early age and kept most of them. She even copied correspondence into the journals, some of which are letters between herself and various artists. The book is full of interesting tales of travel, attendance at the opera, commentary on social espectations and stories about her family life as a child and grown woman. Gertrude was commissioned to sculpt a number of public statues and only to name a few the Monumento a la Fe Descubridora in Spain, the Bill Cody Memorial in Cody, Wyoming, the Inwood War Memorial in Washington Heights, New York. The only one I have seen in person, aside from models in her bedroom at The Breakers in Newport, RI, is the Women's Titanic Memorial beside the Potamic River in Washington, D.C. It is breathtaking (and a model for that scene in the movie Titanic). Additionally, the Metropolitan Museum of Art has one of her pieces, Cayatid, which I find ironic because one of the reasons Gertrude began to support American artists was that the Met initially refused their work. So for several years now, I've had this crush on Gertrude and have forced my own lectures about Gertrude upon my friends. I could probably go on for days about her and what I've learned from her, but go read the B. H. Friedman book and also The Whitney Women and the Museum They Made: a Family Memoir by Flora Miller Biddle, Gertrude's granddaughter and former president of the Whitney Museum, and then go see some art. I guess we should stop kidding ourselves; we've been living the lives of little old ladies in New York City for a while now.